Proving once again that I'm on the cutting edge of this new-fangled Internet gizmo, I now have a Twitter account. Problem is, I'm not savvy enough to tell you how to go find my updates on their website. But if you know and have absolutely nothing better to do, you can check out these little posts to find out how my day is going. It'll be a thrill a minute, I'm sure. 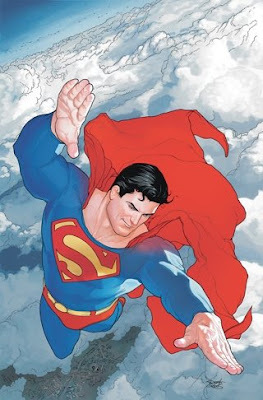 I was a big Superman fan when I was a little kid, probably because some of the first comic books I ever read had Superman in them. Then, for a long time, I didn’t have much interest in the character. Now, though, I kind of like old Supes again. The trade paperback THE THIRD KRYPTONIAN reprints a three-issue story arc and a couple of stand-alone stories from last year, and they’re pretty darned good. I’m not really up to speed on current continuity, so a few things took me by surprise (Clark and Lois have a foster son now? First I’ve heard of it! ), but I didn’t have any trouble following the stories. I kind of like the kid, too. He’s a Kryptonian, from either the bottle city of Kandor or the Phantom Zone, I don’t remember which, but he’s not the Third Kryptonian of the title. That’s a whole other character who gets Superman involved in a fairly complicated yarn about deserters from the Kryptonian navy, space pirates, wholesale destruction of worlds, cosmic vengeance, and assorted good stuff like that. There’s plenty of action in this story arc. As if to balance that out, the two stand-alones are much quieter and reflective, and I liked them quite a bit, too. I’m not surprised I enjoyed the stories, because the primary writer on them is Kurt Busiek, one of my favorite writers working in comics today. If you like comics and haven’t tried his work, you need to run out and find copies of MARVELS and the various ASTRO CITY books. Wonderful stuff, especially for long-time comics fans (*cough* geezers *cough*) like me. This book should be out this week, if it's not already. I have a soft spot in my heart for it, because it's the last book that was written in my old studio. I had started another one before the fire and written about 200 pages of it, but I lost that and had to start over. (That book will be out this week, too, but it's one of those ghost jobs I can't talk about.) 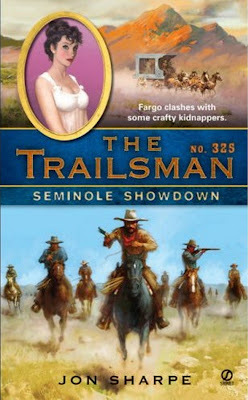 I remember that the first book I wrote in the studio was COSSACK THREE PONIES, but I have no idea how many there were between it and SEMINOLE SHOWDOWN. Quite a few, though. It was the best place I ever had to work. I'm hoping that my office in the new house will be even better. On the heels of the news about Bill Knott’s death comes belated word that award-winning Western author Fred Grove passed away in September. 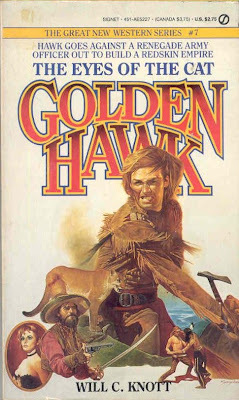 He began writing for the Western pulps in the Fifties and went on to produce numerous novels in the Sixties, Seventies, and Eighties, often for Doubleday and often concerning horses and horse racing in the Old West. I don’t believe I’ve ever read any of his novels, but I have read some of his short stories (many of which have been reprinted in paperback collections from Leisure Books in recent years) and enjoyed them. 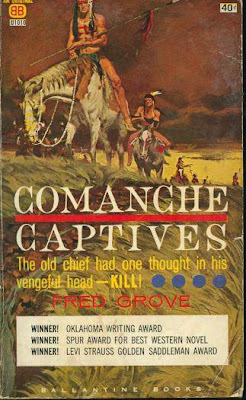 Fred is another author I met once at a Western Writers of America convention. In this case it was San Angelo in 1990. I sat next to him at a barbecue dinner that was held on a ranch west of town. I tell you, there are a lot worse ways to spend a few hours than sitting at a picnic table under some trees next to a creek, eating good barbecue and talking to Fred Grove. I had a fine time, and I’m sorry that he’s gone. I finished my 225th novel today. I don't post much about writing anymore, but it seemed like that was a worthy enough milestone to mention. And tomorrow morning I'll start #226. I heard the sad news today that author Bill Knott has passed away. His books were usually bylined Will C. Knott or published under a house-name. 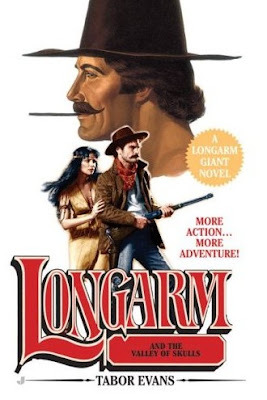 He was best known as a Western writer and contributed to three long-running series – Longarm, the Trailsman, and Slocum – as well as working on other series and writing stand-alone traditional Western novels under his own name. He also wrote several mystery novels, some house-name men’s adventure yarns, and a number of mystery and sports books for the young adult market. I don’t know how many books he wrote in his career, but more than 200, certainly. I met Bill Knott only once, at a Western Writers of America convention in Arkansas, and didn’t know him well at all. We had a number of mutual friends, though, and I’ve read and enjoyed many, many of his books over the years. He was one of the original authors on the Longarm series (along with Mel Marshall and the series’ creator, Lou Cameron), and I had read a lot of his entries before I ever started writing for the series myself. He was also a regular contributor to the Stagecoach Station series under the house-name Hank Mitchum, just before I started writing for that series. In fact, although we wrote for many of the same series, I don’t think our tenures ever quite overlapped. (I haven’t tried to look this up, so I could well be wrong.) He was the president of WWA at one time, an important figure in the history of the Adult Western field, and a fine writer. I’m sorry to hear that he’s gone. I’ve never been a big fan of naval historical fiction. I’ve read some of the Horatio Hornblower novels by C.S. Forester and the occasional stand-alone. I’ve even written some fairly extensive naval sequences in various historical novels, but it took a lot of research because I’m not a sailor. 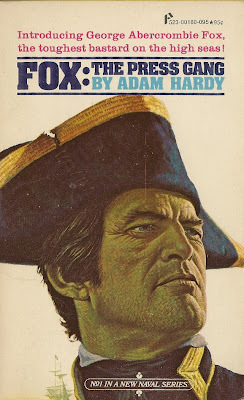 I am a paperback junkie, however, so when I was in Half Price Books recently and saw that they had all eleven books in the Fox series, published by Pinnacle in the mid-Seventies, for a very reasonable price . . . Well, you know what I did. I bought them. I used to own this series but never got around to reading any of the books. Now I’ve read the first one, THE PRESS GANG, and I enjoyed it quite a bit. George Abercrombie Fox is not your typical clean-cut naval adventure hero. A product of London’s slums, he started out as a powder monkey when he was just a boy and has risen in the ranks until he’s the second lieutenant on the British frigate Tigress in 1800, fighting the French. Fox is a morally conflicted anti-hero, capable of brutality and violence but still possessing a certain amount of sympathy for the men who serve below-decks in the British navy. He also has an odd physical quirk: in moments of high stress, he goes blind in one eye. The plot of this novel meanders along. The Tigress gets in battles with French ships, and then lands an English spy on the coast of France in the dark of night, and then Fox has to help put down a mutiny . . . but then part of the way through, the story takes a twist I hadn’t expected and the pace picks up. The action scenes are well-done, although some of them include so much sailing jargon that they’re almost gibberish to me. There’s plenty of cutlass-swinging and decks awash with blood when the action takes place in closer quarters, though. The main appeal is the character of George Abercrombie Fox, who somehow comes across as likable despite his often unsympathetic actions. He’s hell on wheels in a fight, that’s for sure. 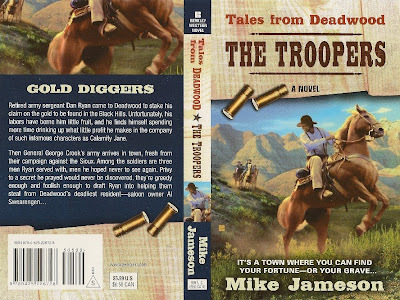 Here's the cover for the fourth Tales From Deadwood novel, THE TROOPERS. It won't be out until next spring, but don't worry, I'll remind you of it again between now and then. At this point I don't know if there will be a #5, but I hope so. I read the page proofs for this one recently and thought it was a pretty good book, if I do say so myself. 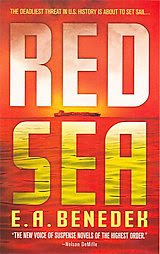 As I’ve mentioned here before, I don’t read too many big, international thrillers anymore, but I still like a good one every now and then, and RED SEA by E.A. Benedek falls into that category. It begins with three airliners being blown out of the sky by terrorists. You could almost call this an anti-terrorism procedural, because it follows the efforts of an FBI agent, a reporter, and an Israeli intelligence agent to discover who was responsible for the bombings and how they pulled it off. Naturally enough, the three investigations soon intertwine, and our heroes discover that the downing of the airplanes is just the beginning of a larger and much more dangerous plot. Benedek, a journalist who has written a considerable amount of non-fiction about international affairs, knows her stuff. There’s plenty of behind-the-scenes information about how terrorists plot are uncovered and investigated, and it all rings true. As a first-time novelist, Benedek sometimes tends to let these info-dumps get out of hand, but for the most part the pace moves along quite nicely. Her protagonists are likable and well-drawn. I also like the way she gives one of them a personal stake in the story, and that ties in with a satisfying ending that’s set up very early on, something I always enjoy. Also, in a book like this you’d expect the climax to involve a lot of high-tech weaponry. Instead, we get a low-tech but very suspenseful showdown. Good stuff, and the best part of the book for me. If you like globe-trotting, large-cast, high-stakes thrillers, I think you’ll probably enjoy RED SEA. I liked it well enough to be looking forward to seeing what Benedek comes up with next. Take a Korean War vet who’s an LA county sheriff’s deputy in 1957, have him leave Chicago after visiting relatives and head back to California along Route 66 in a souped-up hot rod, drop him down in the middle of a mystery involving several murders, vengeful gangsters, a fortune in missing loot, and a beautiful young woman on the run, and what do you have? The ingredients of a vintage Gold Medal novel, right? Nope. 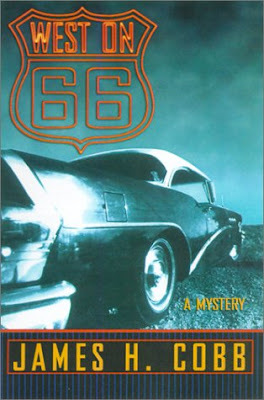 WEST ON 66 by James H. Cobb was published by St. Martin’s in 1999. I don’t know if it’s actually a forgotten book, but I’ve never heard or read anything about it, so that’s good enough for me. And the book itself is more than good enough. The plot is fairly complex, the pace races right along (as you’d expect in a book that features several fast cars), and the narrator/hero is extremely likable. The action scenes are very good; there’s a long, explosive scene near the end that’s just wonderful, so much so that it overshadows the rest of the book a little. While WEST ON 66 isn’t quite the pitch-perfect recreation of an era and a writing style that, say, Max Phillips’s FADE TO BLONDE is, it’s darned close to that level. My biggest complaint is that in a few places the author gets a shade too cute for my taste, such as when the hero is searching for a pay phone to make an important call and thinks that it sure would be handy if somebody invented a phone you could carry around in your pocket. I’m sure I do that myself sometimes, too. I’m not a big reader of near-future techno-thrillers, but Cobb’s debut novel, CHOOSERS OF THE SLAIN, is great, probably the best novel I’ve ever read in that genre. It could almost qualify as a forgotten book itself, since I haven’t heard anyone mention it in years. It’s pretty easy to find and well worth looking for. So is the sequel, SEA STRIKE, which is almost as good. I imagine the other two or three books in the series are, too; I just haven’t gotten around to them yet. I’m glad I came across WEST ON 66, though. It’s one of the best books I’ve read this year. I find it interesting that while most superhero comics are and have always been science-fictional in nature (think about the origins of Superman, Spider-Man, and the Fantastic Four, for example – all grounded in scientific speculation), characters who are magical and often operate in mystical realms have always been part of the mainstream Marvel and DC universes as well. Going all the way back to the beginning of the Golden Age, Zatara the Magician was one of the characters featured in ACTION COMICS #1 (which also introduced Superman), and not long after that, The Spectre and Dr. 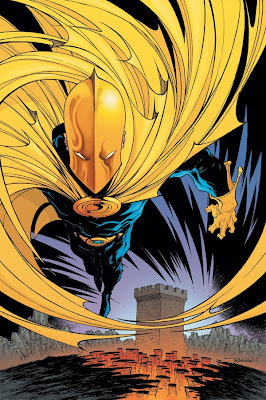 Fate showed up in the DC universe. I first encountered Dr. Fate in the Sixties, in a pair of stories in SHOWCASE that teamed him with another Golden Age hero, Hourman. I liked those issues quite a bit. I’ve read other Dr. Fate stories over the years, most of them with different characters wearing the golden helmet that’s possessed by the spirit of the ancient Egyptian sorcerer Nabu. (Trust me, it makes sense in the comics.) In the most recent version of the character, the helmet returns to Earth after being flung across the cosmos by Captain Marvel and winds up in the possession of Kent Nelson, the grandnephew of the original Dr. Fate from the Golden Age. This Nelson is a former psychiatrist who has fallen on hard times because of a malpractice suit that bankrupted him, cost him his family, and left him a drunken, homeless bum. Just the kind of guy you’d want to entrust with almost limitless sorcerous power. These stories originally appeared in a limited-run comic called COUNTDOWN TO MYSTERY and have now been collected in a trade paperback of the same name. They were written mostly by Steve Gerber, who was one of my favorite comics writers during the Seventies for his work on MAN-THING and HOWARD THE DUCK. Gerber was ill while working on this series and in fact passed away after writing seven of the eight issues. I hadn’t read any of his stories in years but was pleasantly surprised to find that his prose was as smooth as ever, and his plots, while not reaching the heights of his earlier work, were still imaginative and thought-provoking. These stories are set in Las Vegas, and Gerber and the various artists who worked on the series do a fine job of capturing both the seediness and the glamour of the setting. For the eighth and final issue, four friends of Gerber’s provide short, alternate endings for the series. These don’t work as well as what came before and seem a little rushed to me, but they’re good tries, and several of them incorporate tributes to Gerber’s earlier work, which I appreciated. If you’re not familiar with Dr. Fate and the DC universe, I don’t know that I’d recommend COUNTDOWN TO MYSTERY. Some of it wouldn’t make a whole lot of sense. But if you’ve read Dr. Fate stories before, even just the ones from the Golden Age or the Sixties, you can jump right in and enjoy this collection. I certainly did. I haven’t written anything here about movies lately, although we’ve continued to watch one every now and then. Mostly I’ve just lacked the time and the inspiration to post about them. I did like both 21 and WHAT HAPPENS IN VEGAS, though, the first being a pretty good caper movie, the second an okay romantic comedy aided by the fact that I just can’t help but like both Cameron Diaz and Ashton Kutcher. 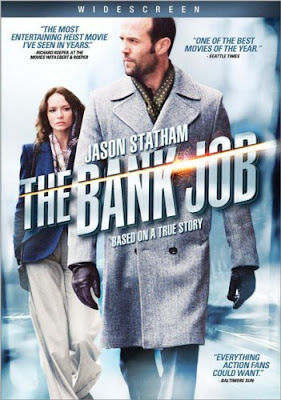 However, last night we watched THE BANK JOB (speaking of caper movies), and I thought it was excellent. I’ve mentioned here before that I like Jason Statham, and he’s good as always as the leader of a gang of would-be bank robbers who are in really, really far over their heads without even knowing it. This is the sort of movie that mixes a number of intermingled plotlines. You’ve got amateur crooks, professional crooks, good spies, bad spies, good cops, corrupt cops, and they’ve all got an interest in what’s in the safe deposit boxes in a branch of Lloyds Bank in London. As I was watching the movie, I asked myself how the filmmakers were going to tie everything together and have it make sense, but by golly, they do. The ending is pretty satisfying, in fact. THE BANK JOB is supposedly based on a true story, but I have no idea how closely it sticks to the facts. I’ve read several articles recently about how far most movies “based on a true story” actually stray from the truth (in THE EXPRESS, one of those inspirational sports movies that’s opening this weekend, it’s very far indeed, according to what I’ve read), but I don’t mind that too much as long as I’m entertained. THE BANK JOB entertained me, so I don’t hesitate to recommend it. 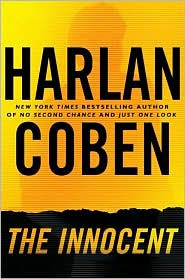 Having read and enjoyed my first Harlan Coben novel recently (THE WOODS), I read THE INNOCENT, which shares a couple of supporting characters with the other book. In this one, the protagonist is Matt Hunter, a young man who gets involved in a fight at a frat party in college, winds up going to prison for manslaughter when one of the people he was fighting with dies, and then tries to rebuild his life after being released. He seems to be doing so: he has a good job as a paralegal, and he’s married to a beautiful woman who’s now pregnant. And then, of course, everything goes haywire as all sorts of trouble from the past crops up. 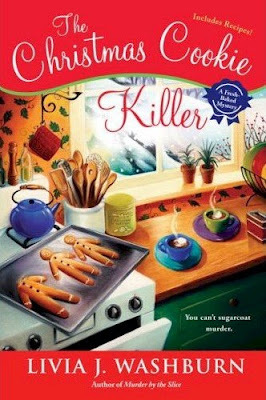 Before you know it, Matt is on the run from the cops, suspected of two murders, and somebody wants him dead. I enjoyed this one every bit as much as THE WOODS, maybe even a little more. I like the way Coben writes. He has one of those styles that just seems to resonate with me and keeps me turning the pages. And I always like incredibly complex plots where nothing is what it seems to be at first. This one relies a little heavily on coincidence in a place or two, but hey, coincidences happen. For what it’s worth, Coben saves one little twist for the very end, and that one I saw coming, even though I didn’t figure out much of the rest of the book ahead of time. I have another Coben novel sitting on the shelf waiting to be read soon, JUST ONE LOOK. I’ve been told it’s one of his best. And I plan to get around to his Myron Bolitar series one of these days, too. In the meantime, I recommend THE INNOCENT. It’s a very entertaining book. I'm probably not the go-to guy for opinions on anything related to H.P. Lovecraft, but one of the commenters on the previous post mentioned his new web-comic LOVECRAFT IS MISSING, so I took a look at it. The first few installments are up, and I plan to continue reading it as new pages are posted. I like the art, I like the writing, and I'm very curious to see where the story is going. Good stuff, and if you're interested in comics, Lovecraft, or pulps in general, I recommend that you check it out. You’ll need to pull out your pulp adventure checklist for this one. Let’s see . . .
Lost city? Check. Takes place in Karnux, a lost city populated by Aztecs and located in the crater of an extinct volcano in northern Mexico, five hundred years after the Aztec empire was destroyed in Cortez’s conquest of Mexico. Stalwart hero? Check. Larry Starling is the infant son of a pair of American geologists whose expedition runs afoul of . . . well, we’ll get to that. Beautiful heroine? Check. Esta, the young, hot queen of the Aztecs. Evil villain? You bet. Tarx, the high priest who sacrifices Larry Starling’s parents and is about to kill the innocent toddler when King Montezirka intervenes and decrees that the kid must live because he might turn out to be Ozar the Aztec, who, according to legend, is supposed to be a fair-skinned god who will someday come to free the people from oppression. So Larry Starling, instead of being sacrificed, is sent off to live in the mountains with the old arrow-maker Claxitl for the next twenty years, after which time he will return to Karnux to see if he can fulfill the Five Sacred Commands that will prove him to be Ozar the Aztec. Back in the Twenties and Thirties, it was a common practice in pulp magazines to run a series of linked novelettes that, read in order, constitute a novel of sorts. 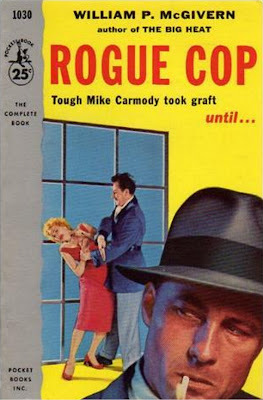 Quite a few such serials were later published as fix-up novels, in fact. In the six issues from January through June of 1933, the Street & Smith pulp TOP-NOTCH published the Ozar the Aztec series, written by Walker A. Tompkins under the pseudonym Valentine Wood. The titles of the stories are “Ozar the Aztec”, “Ozar and the Plumed Serpent”, “Ozar and the Jade Altar”, “The Death Drums of Ozar”, “Ozar and the Black Skull”, and “Ozar’s Crown of Victory”. Each story recounts another story of Ozar romancing Queen Esta and foiling the nefarious plots of the high priest Tarx. If you’ve read this far, you probably have a pretty good idea whether or not you’ll like these stories. They’re full of action and melodrama and were rather obviously inspired by Edgar Rice Burroughs. More than anything else, though, they reminded me of a Thirties movie serial, full of death traps, secret passages, and narrow escapes by our hero Ozar. I can almost see it in my mind, with the Republic Pictures back lot standing in for the lost city of the Aztecs, Ray Corrigan or Buster Crabbe playing Ozar, and William Witney and John English directing the action. It would’ve been a dandy. Walker A. Tompkins is better known as a Western writer, and I’ve been a fan of his work for a long time. His plots tend to have some holes in them, and that’s certainly the case in these stories, but I like the headlong pace and the way his writing flows. I thoroughly enjoyed the Ozar stories. They’re going to be reprinted soon in a single volume by Beb Books, and if you’re still in touch with your inner 12-year-old, as I am, I think you might enjoy them, too. Just imagine you’re reading one of those small-size Ace paperbacks from the mid-Sixties, with a Roy G. Krenkel or Frank Frazetta cover. Ozar would have been right at home in one of those. My only complaint is that the stories are left crying out for a sequel, and as far as I know, there never was one. If I had more time and a market, I’d be tempted to write it myself . . .
Livia has a couple of new photos up over on her blog. The porch goes almost all the way around the house, so I was thinking that when the weather is nice I can sit on the back porch in the morning and work, and in the afternoon I can sit on the front porch. We'll see how much work I get done that way, especially if I'm sitting in a comfortable chair. Now available in fine bookstores everywhere! I was in a bookstore yesterday and noticed that the new Longarm Giant is out. Like the past two Giant editions, this one features guest appearances by characters from other Western series -- in this case, the men of Easy Company, a cavalry series published by Jove back in the Eighties, and John Fury, the hero of a short-lived series from the Nineties. 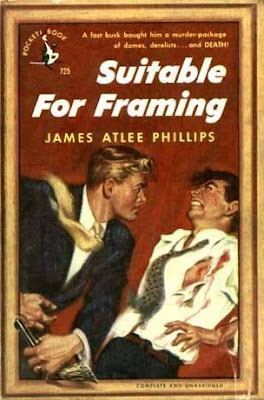 Like last week’s THE FAST BUCK, James Atlee Phillips’s novel SUITABLE FOR FRAMING concerns treasures looted during World War II. That’s where the similarities end, though. In SUITABLE FOR FRAMING, the things everybody is after are fabulously valuable paintings, rather than jewels. And SUITABLE FOR FRAMING is much better written than THE FAST BUCK. The narrator in this novel is Jesse Barker, a journalist who gets finagled into joining a scheme to smuggle some paintings out of France following World War II and sell them to a Mexican general Barker happens to know. Most of the book takes place in the Mexican mountain town of Hidalgo, and Phillips paints a very vivid picture of this setting. As anybody who has read very much in this field will expect, the plot falls apart and becomes a maze of double-crosses, and of course there’s a beautiful woman involved, and Barker gets hit on the head and knocked out several times. Plus you get a colorfully eccentric (and really evil) villain, Mexican wrestlers, spooky scenes set in graveyards, and a considerable amount of action. I’ve always liked Phillips’ novels about espionage agent Joe Gall, which he wrote under the name Philip Atlee, although the plots in them sometimes get so complicated that I can’t keep up with them. I also really like his early novel PAGODA, which introduces Joe Gall when Gall was still a pilot, rather than a spy. SUITABLE FOR FRAMING is a little lighter weight than those books but shares many of their virtues: crisp prose, good descriptions, and hardboiled action. One thing that annoyed me was Phillips’ habit of paraphrasing what his characters are saying, rather than just quoting the dialogue, but I sort of got used to that technique after a while. As a rule, though, I don’t like that. I liked the book overall, though, and I think if you’ve read and enjoyed Phillips’ other novels, you’ll enjoy this one, too. It would be a natural for Hard Case Crime to reprint. It reminded me quite a bit of David Dodge’s PLUNDER OF THE SUN.